Hosting your first dinner party can be a little daunting. Do you buy décor for the table? What kind of drinks should you put on? Will canapés make an appearance? With a multitude of different options and things to consider, it can be tricky to know where to start. Let’s strip it back to basics. A harsh reality but true. It’s always good to be ahead of the game. Plan everything out in advance that you possibly can. From the menu and all it’s intricacies, to the décor and where people will be seated. Planning ahead will always ensure that your evening runs smoothly. If you can do, prepare as much of the food as possible the day before. This could be everything from preparing vegetables and side dishes, to folding napkins and writing table place cards. Why not add music to the evening? The day before, plan your playlist out either on your phone or laptop. Music can be the making or breaking of a good dinner party; the last thing you want on the night is surprising your guests with a thrash metal playlist Spotify has kindly curated for you! Do you have enough glassware, crockery and serving dishes? And not forgetting the dreaded cutlery! Often a point that catches many people out and one that can easily be sorted in advance. A week or so before the evening, take inventory of what you currently have in your cupboards. With dinner parties becoming an increasingly popular trend, many people are opting to invest in separate crockery and glassware which they can easily store in a sideboard in their dining and living space. Having this on hand and separate from your day-to-day plates and bowls means you will always be ahead of the game when your dinner party approaches! And not forgetting cutlery. The bane of many people’s lives, especially if you have children. The endless buying of additional forks that don’t match and teaspoons that are different sizes, the struggle is real. By having a different set which is saved and stored in a separate space can be a game changer in the world of hosting a dinner party. Not only that but having a sideboard in your home can also make struggling to store wine for the event, a thing of the past. With a plethora to choose from, storing additional crockery, cutlery and wine has just become a whole lot easier. Light the candles, uncork the wine, you’re almost ready to go! 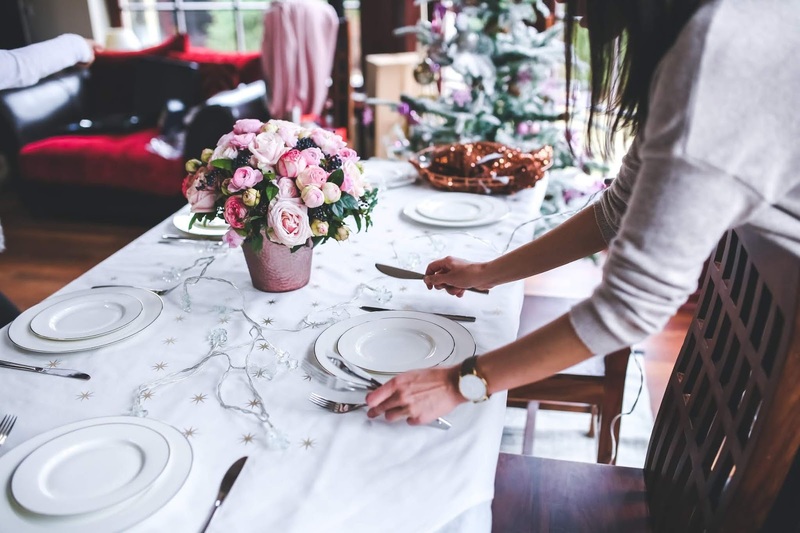 Once your table is set, decorations laid out to perfection, and the food is cooking away in the kitchen, don’t forget to pour yourself a glass of wine and relax. You’ve done all the preparation, you’ve planned in advance; and don’t forget to press play on your lovely curated playlist which you prepared yesterday to really set the mood. Above all, remember to enjoy the evening. You deserve it, and your guests will feel much more at ease if you’re also enjoying yourself. Being the hostess with the mostest is no easy task. With so many things to think about, it’s easy to get caught up with the excitement of it all. Have a plan, be prepared and enjoy yourself.